This year Lake Superior froze over upwards toward 90%, reaching a 10 inch average for ice thickness. To get to these "ice caves" in the following images, you walk along the southern shore over the ice on Lake Superior. The North Shore in Minnesota is by far one of my favorite destinations to visit. All year round it offers an escape away from city life. Even if you only have a day to spend up there, you can get a nice fill of solitude and trails. This year was the first time I had ever visit the shore in winter, and I was in aw by frozen shores, ice slabs floating in the Lake Superior, and then as you drive further and further up the shore, it turns into clear waters and bright blue skies. 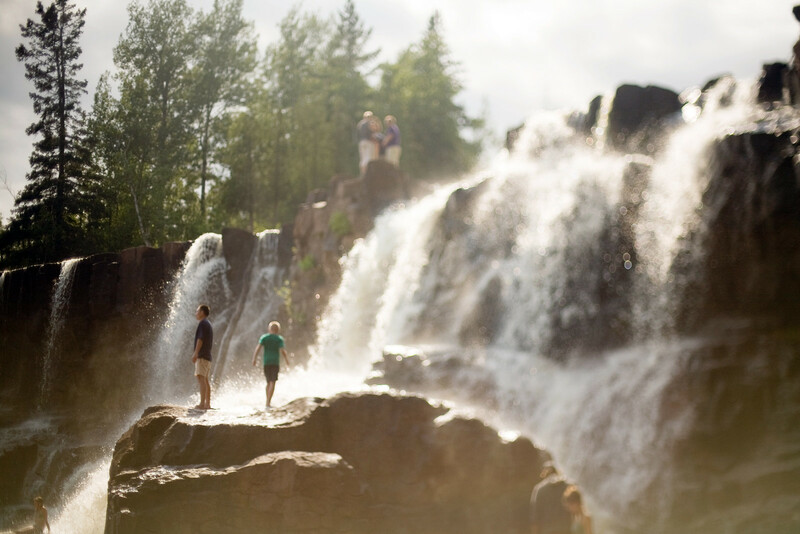 The site of these waters and being able to breathe in the crisp northern Minnesota air puts me in a state of elation. Along the shore there are many waterfalls to hike into. With only a day up north you can really only travel to one of them. Well worth the trip we made. Water that was once rushing over rocks, creating deep pools was now frozen with ice thick enough to walk over it all. In some spots snow and ice revealed the force under the ice. Water was still rushing along as it had when it was melted, just hidden underneath. A dangerous surprise if you're not careful. Thrifty Finds Are One of A Kind. You can find some pretty awesome things at the thrift store, and this dress was one of them. It fit Anna perfectly, all for a whopping $3! Even if we only use it just this once for a fun shoot, it was totally worth it. Also, I couldn't wait to get out and shoot with Canon's Mark II, which is my most recent investment. My 5D has been taped together, and I've noticed a drop in quality at some recent shoots, so I have put it on the shelf to rest, and will use it as a back up now. Anna's gloves make for a perfect reflector. This guy wanted to get a photo taken with Anna. Nothing better than ending the day with truffles from this place. Every year in Minneapolis, Minnehaha Falls freezes over. Just about every photographer in the area has been here, but that shouldn't be a reason to stay away. This formation is awe inspiring, and when you get here at sunrise, you are alone. That's the best part. I had the chance to sit down and write a bit while I was behind the falls. Splish, splash, trickle, and drop. Water droplets everywhere. The more you focus on them, the sound becomes deafening, their numbers only multiplied as morning goes on. Sunlight takes over as it rises above the hill. Columns have formed over time from freezing water, and have created windows, allowing light to illuminate the cave behind. Periodically ice will detach from its frozen home on the waterfall, causing an avalanche of ice to erupt on impact - shaking you to the very core - you would think the entire waterfall was collapsing. It happened sooner than I thought! We met up to take some photos at the Walker Art Center's Sculpture Garden. It turned out to be a snowy and gray day, so location turned out perfect with heat, beautiful colors, and a great space. Needless to say, I've definitely been broadening my horizons lately. I've been a bit behind on posts and edits lately. Just getting around to catching up. Lots of changes and fun things have been going on, along with opportunities that have been popping up left and right. I've never sat down with another human and taken shots in a studio like fashion (except for that slack class of a graphic design course I had in high school, when all we would do is screw around, and come to eventually blew up a strobe, getting us kicked out of the studio area). Natural light is my friend, and spontaneity is a common theme to most portraits I have ever taken. My method of portraits stem from two things: 1) My inability to direct and tell people what to do, along with the fear of not being able to accomplish the task, and 2) My thoughts of capturing who the person is from spontaneity (which explains why my camera is plastered to my face, but, can't miss a moment). So, I am pushing myself to get out there and accomplish what I know I can do, while ignoring that dreadful, "I can't," thought. We all start somewhere. It's a matter of keeping at it. This really was a fun shoot to do. Anna hung out at Caribou until I got off of work to help (she's awesome with kids), and Jhermayne brought his daughter, Kamani, to meet us there. We chilled for an hour or so, playing, letting the little one drink her hot chocolate and pick at a cookie (which eventually became Jhermaynes), all while snapping shots. Kamani, just being her. She was shy at first, but eventually warmed up and kept wanting to pose and take pictures once she learned what i was doing with that contraption of glass, plastic, and metal in front of muh face. I think we are going to keep updating pictures when months go by and Jhermayne picks up outfits for her. A fun way to watch her grow too. Looking forward to it.